Arnone A. X-Ray diffraction study of 2,3 DPG to human deoxyhemoglobin. Nature, 237: 146-149, 1972. Drayna D. Founder mutations. Scientific American 293 (4): 60-67, 2005. Edelstein SJ. The sickled cell. From miths to molecules. Harvard University Press, 1986, 197p. Naoum PC, Naoum FA. Doença das Células Falciformes. Ed. Sarvier, São Paulo, 2004, 224p. Perutz MF. Structure and function of hemoglobin. 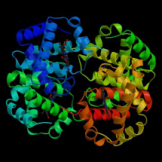 A tentative atomic model of horse hemoglobin. J.Molec. Biol. 13:646-668, 1965. Provan D., Gribben J. Molecular haematology. Blackwell Science Publ. 2000, 231p.